Kettlebells are not a new invention. They have a history with the Russian Military and sports people of the past and present. Kettlebells are so old that no single nation can lay claim to inventing them. A kettlebell is like a cannon ball with a handle and can be found in a selection of weights - from 4kg-48kg. Karls Ernst, born in Berlin 1846, was one of the first kettlebell lifters known by name. During the 1870s as a strong man, he appeared throughout Germany, Estonia and Russia. He became a father-figure for many famous personalities in the world of strength. Kettlebells are different from other forms of resistance equipment. Any weight will fight the gravitational pull of the earth, but with the kettlebell weight being suspended below the handle, this increases the pull away from the body - resulting in the lifter constantly fighting to control the kettlebell, as opposed to a barbell or dumbbell that can be "balanced" during an exercise. This makes the kettlebell unique, since your body's muscles are always working in order to simply control it. When you swing the kettlebell you need strength, speed and co-ordination. At the bottom of a kettlebell swing it has been estimated that you would be pulling between four and seven times its actual weight. As well as improving strength and power, kettlebells can benefit rehabilitation, flexibility, fitness and even weight loss. Increasing lean muscle mass is crucial if you want to burn the maximum calories possible in one workout and kettlebell training is a powerful tool to use in the pursuit of that goal. Kettlebell workouts are famous for burning fat away due to some of the total-body ballistic movements you can do - swings, snatches and cleans are some of the more popular base moves. As well as the big calorie burning moves, you can also strengthen your centre and get a rock-hard stomach with some of the core moves - seated russian twists, windmill and turkish get-ups are popular. 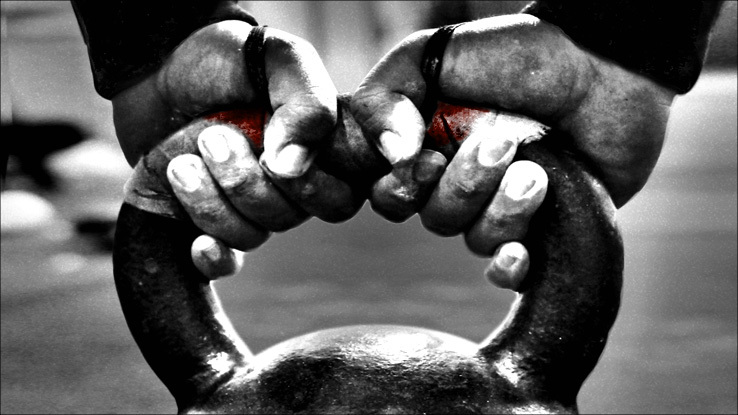 Kettlebell training takes skill and practice, but remember, anyone who decides to mix kettlebell training into their fitness routine should start with a light kettlebell until the technique is perfected - techique is essential. Kettlebells can actually confirm that if we look to our fitness past , we might actually find the answers to get the results in the future.